This article is about the African-American singer, songwriter and record producer. For the U.S. Ambassador to Norway, see Barry B. White. 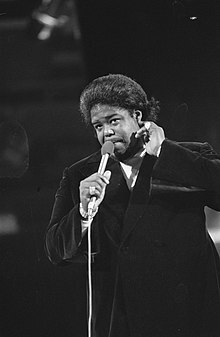 Barry Eugene Carter (September 12, 1944 – July 4, 2003), better known by his stage name Barry White, was an American singer-songwriter, musician, record producer and composer. White was born Barry Eugene Carter on September 12, 1944, in Galveston, Texas. His father was Melvin A. White, and his mother was Sadie Marie Carter. His parents never married, so his mother gave him her last name, but he later took on the surname of his father. He grew up in South Central Los Angeles, California. He was the older of two children; his brother Darryl was 13 months younger. White grew up listening to his mother's classical music collection and first took to the piano, emulating what he heard on the records. White has often been credited with playing piano, at age 11, on Jesse Belvin's 1956 hit single, "Goodnight My Love". However, in a 1995 interview with the Boston Herald, White denied writing or arranging the song. He believed the story was an exaggeration by journalists. While White and Belvin lived in the same neighborhood, Belvin was 12 years older than White. White also stated that he had no involvement with Bob & Earl's 1963 hit single "Harlem Shuffle", a song he is credited with producing  and in his 1999 autobiography, White confirmed the song had been produced by Gene Page, who had worked with him on many of White's 1970s successes. White's voice deepened suddenly when he was 14. He recalled, "[As a child], I had a normal squeaky kid voice. Then as a teenager, that completely changed. My mother cried because she knew her baby boy had become a man." White's brother Darryl was murdered in a clash with a rival gang, and White himself was jailed for four months at the age of 16 for stealing $30,000 worth of Cadillac tires. While in jail, he listened to Elvis Presley singing "It's Now or Never" on the radio, an experience he later credited with changing the course of his life. After his release from jail, White left gang life and began a musical career at the beginning of the 1960s in singing groups. He first released "Too Far to Turn Around" in 1960 as part of The Upfronts before working for various small independent labels in Los Angeles. He also recorded several singles under his own name in the early 1960s, backed by vocal groups the Atlantics (for the Rampart and Faro labels) and the Majestics (for the Linda and Jordan labels). Bob Keane of Del-Fi Records—the man who discovered Ritchie Valens—hired him as an A&R man in the mid 1960s, and White started working with the label's artists, including Viola Wills and The Bobby Fuller Four, as a songwriter, session musician, and arranger. He discovered singer Felice Taylor and arranged her song "I Feel Love Comin' On" co-written with his friend Paul Politi. It became a big hit in the UK. Other charting hits written by White and Politi for her included "It May Be Winter Outside (But in My Heart It's Spring)" and "Under the Influence of Love". White also wrote "Doin' the Banana Split" for TV bubblegum act The Banana Splits in 1968. In 1972, White got his big break producing a girl group he had discovered called Love Unlimited. Formed in imitative style of the Motown girl group The Supremes, the group members had gradually honed their talents with White for two years previously until they signed contracts with Uni Records. His friend Paul Politi hooked him up with music industry businessman Larry Nunes, who helped to finance their album. After it was recorded, Nunes took the recording to Russ Regan, who was the head of the Uni label owned by MCA. The album, 1972's From A Girl's Point of View We Give to You... Love Unlimited, became the first of White's string of long-titled albums and singles. White produced, wrote and arranged their classic soul ballad "Walkin' in the Rain with the One I Love", which climbed to #14 in the Billboard Hot 100 Pop chart and #6 on the Billboard R&B chart in late 1972. It became White's first million selling single as a writer and producer. This single also reached #12 in the UK chart. White's voice can clearly be heard in this piece as he plays the lover who answers the phone call of the female lead. Soon after, Regan left Uni for 20th Century Records. Without Regan, White's relationship with Uni soured. With his relationship with Uni over and Love Unlimited contract-bound with the label, White was able to switch both his production deal and the group to 20th Century Records. They recorded several other hits throughout the 1970s, "I Belong to You", which spent over five months on the Billboard R&B chart in 1974 including a week at #1 and "Under the Influence of Love Unlimited", which hit #3 on the Billboard Pop album charts. White married the lead singer of the group, Glodean James, on July 4, 1974. White wanted to work with another act but decided to work with a solo male artist. While working on a few demos for a male singer, he made three song demos of himself singing and playing, but Nunes heard them and insisted that he re-record and release them himself as a solo recording artist. After arguing for days about it, White was finally persuaded to release the songs himself, although he was initially reluctant to step out in front of the microphone. He then wrote several other songs and recorded them for what eventually became an entire album of music. He was going to use the name "White Heat," but decided on using his given name instead. White was still hesitating up to the time the label copy was made. It eventually became White's first solo album, 1973's I've Got So Much to Give. It included the title track and his first solo chart hit, "I'm Gonna Love You Just a Little More Baby", which also rose to #1 on the Billboard R&B charts as well as #3 on the Billboard Pop charts in 1973 and stayed in the top 40 for many weeks. Other chart hits by White included "Never, Never Gonna Give You Up" (#2 R&B, #7 Pop in 1973), "Can't Get Enough of Your Love, Babe" (# 1 Pop and R&B in 1974), "You're the First, the Last, My Everything" (#1 R&B, #2 Pop in 1974), "What Am I Gonna Do with You" (#1 R&B, #8 Pop in 1975), "Let the Music Play" (#4 R&B in 1976), "It's Ecstasy When You Lay Down Next to Me" (#1 R&B, #4 Pop in 1977) and "Your Sweetness Is My Weakness" (#2 R&B in 1978) and others. White also had a strong following in the UK, where he scored five Top 10 hits and a #1 for "You're the First, the Last, My Everything". In 1973, White created The Love Unlimited Orchestra, a 40-piece orchestral group to be used originally as a backing band for the girl-group Love Unlimited. However, White had other plans, and in 1973 he released a single with "Love's Theme" (written by him and played by the Orchestra). That same track reached #1 on the Billboard Pop charts. Later, in 1974, he made the first album of the Love Unlimited Orchestra, Rhapsody in White, containing "Love's Theme". White is sometimes credited with ushering in the "disco" sound, seamlessly combining R&B music with classical music. Some also regard "Love's Theme" as the first hit in the actual "disco era". White would continue to make albums with the Orchestra, achieving some successes such as: "Rhapsody in White"; "Satin Soul"; "Forever in Love"; "Midnight Groove"; "My Sweet Summer Suite", Remake of "Theme From King Kong". The Orchestra ceased to make albums in 1983, but continued to support White as a backing band. After six years White left 20th Century in 1979 to launch his own label, Unlimited Gold, with CBS/Columbia Records. Although his success on the pop charts slowed down as the disco era came to an end, he maintained a loyal following throughout his career. Despite several albums over the next three years, he failed to repeat his earlier successes, with no singles managing to reach the Billboard Hot 100, except for 1982's "Change," climbing into the Billboard R&B Top 20 (#12). His label venture was exacting a heavy financial cost on White, so he concentrated on mostly touring and finally folded his label in 1983. After four years he signed with A&M Records, and with the release of 1987's The Right Night & Barry White, the single entitled "Sho' You Right" made it to the Billboard R&B charts, peaking at #17. In 1989 he released The Man Is Back! and with it had three top 40 singles on the Billboard R&B charts: "Super Lover", which made it to #34, "I Wanna Do It Good to Ya", which made it to #26, and "When Will I See You Again", which made it to #32. A 1970s nostalgia fad allowed White to enjoy a renewed wave of popularity in the 1990s. After participating in the song "The Secret Garden (Sweet Seduction Suite)" from Quincy Jones's 1989 album Back on the Block, White mounted an effective comeback with several albums, each more successful than the last. He returned to the top of the charts in 1991 with the album Put Me in Your Mix, which reached #8 on the Billboard R&B Albums chart and the song by the same name reached #2 on the Billboard R&B singles chart. In 1994, White released The Icon Is Love, which went to #1 on the Billboard R&B album charts, and the single "Practice What You Preach" gave him his first #1 on the Billboard R&B singles chart in almost 20 years. The album was nominated for a Grammy in the Best R&B Album category, but lost to TLC's CrazySexyCool. In 1996, White recorded the duet "In Your Wildest Dreams" with Tina Turner. 1996 also saw the release of Space Jam and its soundtrack, on which White had a duet with Chris Rock, called "Basketball Jones," a remake of Cheech & Chong's "Basketball Jones" from 1973. White's final album, 1999's Staying Power, resulted in his last hit song "Staying Power," which placed #45 on the Billboard R&B charts. The single won him two Grammy Awards in the categories Best Male R&B Vocal Performance and Best Traditional R&B Vocal Performance. Over the course of his career, White sometimes did voice-over work for television and movies. He voiced the character Brother Bear in the film Coonskin (1975), and also played the character Sampson in the movie's live-action segments. White appeared as himself in a few episodes of The Simpsons. In the episode "Whacking Day", Bart and Lisa used his famous deep bass singing voice, played through loudspeakers placed on the ground, to lull and attract snakes. White was a fan of the show, and had reportedly contacted the staff about wanting to make a guest appearance. White played the role of a bus driver for a Prodigy commercial in 1995, and he also portrayed the voice of a rabbit in a Good Seasons salad-dressing-mix commercial, singing a song called "You Can't Bottle Love". In addition, he did some work for car commercials, most famously for Oldsmobile, and later on, Jeep. White also provided voice-over for Arby's Restaurant commercials on television and radio to promote its Market Fresh menu. White's voice can also be heard in Apple's first iBook commercial. White made three guest appearances on the comedy-drama television series Ally McBeal, as his music was often featured on the show in dream sequences. By the age of sixteen, White had fathered two children with childhood sweetheart Mary. They were married by the time he was nineteen and had four children together. The couple separated in 1969 and later divorced. In 1974, White married singer Glodean James. They had four children together and collaborated on the 1981 album Barry & Glodean. The couple separated many years prior to his death but never divorced. White had a daughter, Denise White, born in 1962 as Denise Donnell to Gurtha Allen. She did not discover who her biological father was until 1988. At the time of White's death, he was dating Katherine Denton, who had given birth to a daughter four weeks previously, claiming it was his. Paternity testing revealed that the baby was not in fact White's. White was overweight for most of his adult life and suffered from related health problems. In October 1995, White was admitted to a hospital as a result of high blood pressure. In August 1999, White was forced to cancel a month's worth of tour dates owing to exhaustion, high blood pressure and a hectic schedule. In September 2002, White was hospitalized with kidney failure attributed to chronic diabetes mellitus and high blood pressure. While undergoing dialysis and awaiting a kidney transplant in May 2003, White suffered a severe stroke, which forced him to retire from public life. On July 4, 2003, White died at Cedars-Sinai Medical Center in Los Angeles at the age of 58. His remains were cremated, and the ashes were scattered in the ocean off the California coast. On September 20, 2004, White was posthumously inducted into the Dance Music Hall of Fame at a ceremony held in New York. On September 12, 2013, which would have been White's 69th birthday, he was posthumously awarded the 2,506th star on the Hollywood Walk of Fame at 6914 Hollywood Blvd in the category of recording. The show Counting Cars paid tribute to White by restoring the last car he owned for his widow, Glodean. In an obituary affectionately referring to White by his familiar nickname, 'The Walrus of Love,' the BBC recalled "the rich timbres of one of the most distinctive soul voices of his generation, about which it was once said: 'If chocolate fudge cake could sing, it would sound like Barry White.'". ^ Smith, Steve (September 20, 2013). "Barry White Gets Walk of Fame Star". San Gabriel Valley Tribune. Retrieved January 6, 2014. ^ Ramardo T. Hunt (April 3, 2018). "BTM - Barry White". YouTube. Retrieved August 26, 2018. ^ "Barry White". Encyclopedia.com. Retrieved August 26, 2018. ^ Bobby Bennett and Sarah Smith, The Ultimate Soul Music Trivia Book: 501 Questions and Answers about Motown, Rhythm & Blues, and More, Secaucus, NJ: Carol Pub. Group, c. 1998. ^ a b Hogan, Ed. "Barry White." www.allmusic.com. Retrieved January 16, 2016. ^ a b White, Barry. "Telephone interview with Larry Katz." June 1 or 2, 1995. The Katz Tapes. Retrieved June 4, 2015. ^ Nelson, Valerie J. "'Harlem Shuffle' co-writer was part of the soul duo Bob & Earl." Los Angeles Times, July 25, 2008. Retrieved January 16, 2016. ^ "Obituary: Barry White". BBC News. July 4, 2003. ^ "Ivor Casey". Ivorcasey.blogspot.com. Retrieved August 26, 2018. ^ Barry White with Marc Eliot, Love Unlimited, New York: Broadway Books, 1999, p. 22. ^ a b Old, Pete. "Barry White Discography". Barry White Unlimited FanClub. Retrieved March 16, 2012. ^ "Staying Power - Barry White - Awards - AllMusic". AllMusic. Retrieved August 26, 2018. ^ "Barry White - Filmbug". Filmbug.com. Retrieved August 26, 2018. ^ Cartwright, Garth (July 6, 2003). "Barry White". The Guardian. ^ a b "Barry White dead at 58". The Sydney Morning Herald. July 5, 2003. ^ Chown, Jon (July 29, 2016). "Barry White's Child Claims She's Been Cut Off". Courthouse News Service. ^ "Singer Barry White dies", BBC, July 5, 2003. ^ "Barry White (1944–2003) – Find A Grave Memorial". Findagrave.com. Retrieved March 26, 2012. Wikimedia Commons has media related to Barry White.